Gastrointestinal complications are the main cause of death in patients with mitochondrial neurogastrointestinal encephalomyopathy (MNGIE). Available treatments often restore biochemical homeostasis, but fail to cure gastrointestinal symptoms. We evaluated the small intestine neuromuscular pathology of an untreated MNGIE patient and two recipients of hematopoietic stem cells, focusing on enteric neurons and glia. Additionally, we evaluated the intestinal neuromuscular pathology in a mouse model of MNGIE treated with hematopoietic stem cell gene therapy. Quantification of muscle wall thickness and ganglion cell density was performed blind to the genotype with ImageJ. Significance of differences between groups was determined by two-tailed Mann-Whitney U test (P < 0.05). Our data confirm that MNGIE presents with muscle atrophy and loss of Cajal cells and CD117/c-kit immunoreactivity in the small intestine. We also show that hematopoietic stem cell transplantation does not benefit human intestinal pathology at least on short-term. We suggest that hematopoietic stem cell transplantation may be insufficient to restore intestinal neuropathology, especially at later stages of MNGIE. As interstitial Cajal cells and their networks play a key role in development of gastrointestinal dysmotility, alternative therapeutic approaches taking absence of these cells into account could be required. Mitochondrial neurogastrointestinal encephalomyopathy (MNGIE) is a rare inherited metabolic disorder caused by loss-of-function mutations in the nuclear gene TYMP leading to thymidine (Thd) and deoxyuridine (d-Urd) accumulation . Alongside classic neurological signs (external ophtalmoplegia, leukoencephalopathy and sensorimotor peripheral neuropathy), chronic intestinal pseudo-obstruction (CIPO) is reported in almost all MNGIE patients and occurs at onset in 45–67% of cases [2, 3]. Other gastrointestinal symptoms include early satiety, nausea, dysphagia, post-prandial emesis, abdominal pain and/or distention and diarrhea . Allogeneic hematopoietic stem cell transplantation (HSCT) corrects the biochemical metabolic imbalance as donor-derived leucocytes and platelets are rich in thymidine phosphorylase . It is effective to relieve CIPO in few reported MNGIE cases  although malnutrition often persists and most cases rely on nutritional support . Neurogenic and myogenic changes and alterations of the interstitial Cajal cells, the gut pacemakers, were reported in MNGIE patients [7–10]. Restoration of gastrointestinal integrity by available treatments however has not yet been addressed. Also, whether small intestine pathology is recapitulated in the mouse model of MNGIE is not known [11, 12]. In this study, we also evaluated the effects of treatment on small intestinal pathology of MNGIE patients and mice. Table 1 reports the demographic data of three MNGIE patients and three controls. Patients were diagnosed based on clinical, biochemical, and molecular features . One patient was untreated, two received HSCT. Written informed consent was obtained for all subjects. Human control tissue was obtained from surgical resections and employed according to the Dutch law where they can be used for secondary use when no objection has been received. This is also valid abroad, because the country of origin is determinant for the rules and regulations for secondary use. Tymp−/-Upp1−/− (KO) and Tymp+/+Upp1+/+ wild type (WT) mice  were bred in filter top cages and fed ad libitum with autoclaved water and irradiated chow. During the course of experiments, mice were monitored carefully for any signs of discomfort. Animal experiments were approved by the ethical committee of the Erasmus University Medical Center, Rotterdam, in accordance with Dutch legislation. pRRL.PGK.TYMP.bPRE4*.SIN self-inactivating lentiviral transfer plasmid containing the human PGK promoter driving TYMP sequence , and the third-generation  packaging and envelop plasmids were used to generate LV-PGK-TP vector particles, by calcium-phosphate precipitation of HEK293T cells . Titration was performed on HeLa cells and titers determined by quantitative polymerase chain reaction (qPCR). Donor KO male bone marrow lineage-depleted (Lin-) cells (BD Biosciences) were transduced overnight with the lentiviral vector at a multiplicity of infection 10 in serum-free modified Dulbecco’s medium with supplements,  conditioned with murine stem cell factor, human Flt3-L, and murine thrombopoietin. Five to 10-week-old recipient KO female mice received 6Gy total body irradiation 24 h prior to tail vein injection of 0.5 × 106 Lin-transduced cells. The experiments included two untreated control groups; Tymp−/-Upp1−/− (KO) and Tymp+/+Upp1+/+ wild type (WT) mice and one Tymp−/-Upp1−/− treatment group (PGK-TP). Tymp−/-Upp1−/− mice were randomly allocated to become either a control untreated mice (KO) or to receive the treatment (PGK-TP). The primary experimental outcomes assessed include: nucleoside levels in urine samples, molecular chimerism and vector copy per cell, and pathological evaluation of the intestine. Bone marrow genomic DNA (Bioké, Leiden, The Netherlands) was used as template for qPCR using primers and SYBR Green PCR master mix (Applied Biosystems, Foster City, CA; Eurogentec, Maastricht, The Netherlands). PCR reactions were carried out in the ABI7900, Taqman machine, and analysis performed with SDS2.2.2 software (Applied Biosystems). The Cycle threshold values were compared against a standard curve obtained from mouse 3T3 to calculate average vector copy per cell, or from male mice bone marrow to calculate Y chromosome chimerism. High performance liquid chromatography (Shimadzu, LC20 series with a binary pump and Photodiode array detector)  equipped with an Alltima C18 5 μ, 250 mm × 4.6 mm column and Alltima C18 5 μ guard column was used to measure urinary Thd and d-Urd. Mice were euthanized by inhalation of a 5% CO2 / 95% O2 followed by 100% CO2 for 4 min, and transcardially perfused with PBS to remove blood. Human and mouse formalin-fixed paraffin-embedded 5-μm-thick small intestine tissue sections were routinely stained for Hematoxylin-Eosin and Phosphotungstic acid-hematoxylin and immunostained as described  against smooth muscle actin (SMA, Dako, 1:200), CD117/c-kit (Dako, 1:50), calretinin (Dako, 1:200), NeuN (Millipore, 1:100), CD3 (Dako, 1:250), CD8 (Dako, 1:50) and glial fibrillary acidic protein (GFAP, Dako, 1:300). Immunoreactivity was detected using 3,3'-Diaminobenzidin or Liquid Permanent Red as chromogen. Pictures were taken with a Leica DM3000 microscope. Muscle thickness was measured on transversally cut intestinal sections (N = 40 for mice, N ≥ 25 for humans). Quantification of muscle wall thickness and ganglion cell density was performed blind to the genotype with ImageJ. Data were analyzed with Graph Pad-Prism5 (version 5.03). Significance of differences between groups was determined by two-tailed Mann-Whitney U test (P < 0.05). Microscopic analysis revealed a preserved layer composition of the small intestine in all MNGIE patients (Fig. 1a, b) with no villous atrophy or significant inflammation. In MNGIE patients, however, the external layer of the tunica muscularis propria was fibrotic and thinner than in controls (Fig. 1c-e), suggesting muscle atrophy. The submucosal plexus appeared normal. In the myenteric plexus, no significant loss or morphologic abnormalities of ganglion cells (identified by NeuN and calretinin immunoreactivity, Fig. 1f-h) and enteric glial cells (identified by GFAP immunoreactivity, Fig. 1k, l) were observed. Cajal cells, however, identified by CD117/c-kit immunoreactivity, were completely lost in all MNGIE patients (Fig. 1i, j). We investigated small intestine histopathology in MNGIE mice using 2 (young) and 12-month-old animals (old) to also check for signs of progression. Hematoxylin-Eosin staining revealed significant atrophy of the tunica muscularis propria and loss of myenteric ganglion cells in old KO compared to young Tymp−/-Upp1−/− and old WT mice (Fig. 2a-d). Unfortunately, CD117/c-kit immunostaining was unsuccessful. We then assessed the effects of treatment on the MNGIE phenotype (Fig. 2). Following hematopoietic stem cell gene therapy (HCSGT), vector copies number per cell and engraftment levels (Fig. 2e) and urinary nucleosides concentrations (Fig. 2f) indicated efficient hematological reconstitution and biochemical correction. Histopathology showed preserved thickness of the tunica muscularis propria in old treated mice compared to Tymp−/-Upp1−/−mice (Fig. 2g, h); however, no significant changes were observed in the number of myenteric ganglion cells (Fig. 2i). MNGIE is associated with gastrointestinal symptoms, including CIPO [2, 3]. Limited understanding of the pathological and molecular mechanisms underlying gastrointestinal complications in MNGIE stems from limited availability of patient tissue and models  that accurately recapitulate the human gastrointestinal pathology. Our study confirms the morphological changes in human MNGIE small intestine, including atrophy and fibrosis of the external layer of the tunica muscularis propria . The selective involvement of this layer has been attributed to physiologically very low mitochondrial DNA amounts making this compartment selectively vulnerable to disease . Muscle wall atrophy was more pronounced in transplanted patients, possibly due to additional HSCT-related stress. We also found complete loss of interstitial Cajal cells and networks in patient’s small intestine. Cajal cells play roles in orchestration of normal gastrointestinal motility and in dysmotility disorders . One study previously described similar findings in a MNGIE patient . Altogether, these findings suggest that Cajal cell loss is a cellular substrate of human MNGIE gastrointestinal pathology. We used Tymp−/-Upp1−/− mice, a model of MNGIE, to investigate whether it recapitulates the human gastrointestinal pathology. 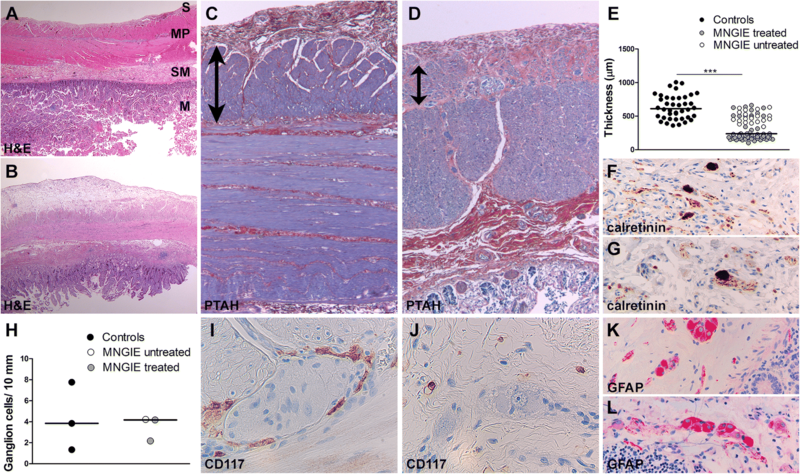 In mutant mice, histopathology revealed atrophy of the tunica muscularis propria as in MNGIE patients and, in addition, loss of myenteric ganglion cells. These features were more prominent in old Tymp−/-Upp1−/−compared to young animals. In Tymp−/-Upp1−/− mice, we did not see presence of Cajal cell on routine Hematoxylin-Eosin stained sections. Unfortunately, CD117/c-kit immunostaining of mouse small intestine was unsuccessful, so that we cannot conclude on Cajal cells absence in Tymp−/-Upp1−/− mice. However, taking our patient and mouse data together, we can suppose a sequence of pathological events leading to MNGIE small intestinal disease, including loss of interstitial Cajal cells and their networks followed by atrophy of the tunica muscularis propria and eventually loss of myenteric ganglion cells . The observed loss of myenteric ganglion cells in the mice, but not in patient’s small intestine may be attributed to inter-species differences and the construct of the MNGIE mouse model being knock-out for both disease-related enzymes. Our study describes, for the first time, the small intestinal pathology in MNGIE patients treated with HSCT. Although the study is limited by the small patient number and short time lapse between treatment and demise, HSCT did not significantly change the trend to intestinal muscle wall atrophy and complete loss of Cajal cells in treated compared to the untreated patient. This suggests that MNGIE small intestinal pathology may not be recovered upon HSCT on the short term follow-up, which could explain the repeatedly reported insufficient improvement of gastrointestinal symptoms in MNGIE patients that do not survive short after treatment . We also report for the first time that enteric glial cell morphology and density are not affected in MNGIE. Functions of enteric glial cells are currently being unraveled, and include autonomous regulation of several gastrointestinal functions, such as exocrine and endocrine secretions, motility, blood flow, and immune/inflammatory processes . We were prompted to investigate glial cells in MNGIE as their central nervous system cellular counterparts, the astrocytes, are primarily affected by MNGIE and their pathology is modified by HSCGT . The HSCT procedure carries a high mortality rate . Recently, HSCGT has been explored in Tymp−/-Upp1−/− mice, providing higher enzymatic levels compared to HSCT and abating the risk of graft-versus-host disease . Due to intrinsic limitations of the mouse model, i.e. lack of an apparent clinical phenotype, only biochemical correction was shown after HSCGT. Moreover, the pathological changes in the intestine of Tymp−/-Upp1−/− mice were never evaluated . Here, we show that the transplanted gene modified cells engrafted well in recipient mice, leading to clearance of systemic nucleosides. The observed atrophy of the tunica muscularis propria was prevented upon HSCGT, whereas the degree of myenteric ganglion cell loss remained unchanged. Similarly as for MNGIE patients, recovery of ganglion cells may take longer than our follow-up of the mice. Alternatively, the possibility that MNGIE permanently affects ganglion cells, including their precursors, cannot be excluded. Our data suggest that allogeneic HSCT may be insufficient to correct gastrointestinal pathology completely, especially at later stages of MNGIE. As interstitial Cajal cells and their networks play a key role in development of gastrointestinal dysmotility, alternative therapeutic approaches taking absence of these cells into account could be required. Irenaeus F. de Coo and Marianna Bugiani contributed equally to this work. We would like to acknowledge the financial support of Join4energy, the Sophia Foundation (SSW0645) and Stichting NeMo. We acknowledge M. Hirano for providing the Tymp-/-Upp1-/- mice. We thank M. Doukas and the Erasmus medical centre tissue bank for selecting and providing the tissue of the control subjects. We are grateful to P. Sillevis Smitt for critically reading the manuscript. This study was funded with financial support of Join4energy, the Sophia Foundation (SSW0645) and Stichting NeMo. The funding bodies had no role in the design of the study and collection, analysis, and interpretation of the data and in writing the manuscript. RY, IFdC and MBu conceptualized the study. RY and MBo performed the experiments. RY, MBo and MBu analyzed the data. RY and MBu wrote the manuscript. NvT, DCH, AF, MBo, EB, IFdC reviewed and edited the manuscript. IFdC and MBu share senior authorship. All authors read and approved the final manuscript. Written informed consent was obtained for all subjects. Animal experiments were approved by the ethical committee of the Erasmus University Medical Center, Rotterdam, in accordance with Dutch legislation.